In today’s podcast episode Matt Gladfelter of Bow Ties and HotDogs shares his list of the pros and cons of operating a hot dog business. As with any business models there are good things and bad things you should be aware of before getting started. Today’s podcast is a bit shorter in length than most episodes, but that doesn’t mean it isn’t an important topic. You may already be aware of many advantages of this business, so we will start out with some of the downsides of operating a hot dog cart first. Hard Work – Anytime you want to generate an income, you’ve got to physically go outside, prepare your cart for service and vend to make money. (This of course assumes you haven’t hired an employee to do the work for you.) After your long day of vending is complete, you will need to do some basic bookkeeping to records sales and check inventory levels. If inventory if low, you’ll need to go shopping to make sure you’ve got enough sausages, buns, and condiments for the next shift. Not a Get Rich Quick Business – If you think you’re going to take your cart out and immediately begin making $100,000 in net revenue per year you will more than likely be disappointed in the results. Sure, there are plenty of hot dog business owners that attain that level of success, but it almost always happens after working the business for a few years. It takes time to find the most profitable vending locations in your city and you may need to scale beyond a single cart to accomplish this. Click here to learn more about the real profit potential of this type of business. Withstanding the Elements – Unless you operate a hot dog truck (which can still be hot in the summer! ), you will need to be prepared to withstand anything that mother-nature throws your way. A perfectly blue sky can quickly transform into rain clouds depending on where you live. As mentioned in the interview, this most recent summer in Tennessee where temperatures regularly went up to 95 degrees and that doesn’t factor in the humidity. On the flip-side hot dog vendors in places like Chicago and New York operate year round and experience hot summers and brutally cold winters. There’s a certain level of toughness you must have to be successful. Dealing with Public – Anytime you operate a customer service based business, including a hot dog stand you will encounter challenging people. Eventually, someone is going to complain about the quality, taste or temperature of their hot dog… Even if nothing is wrong with the product. If you end up serving at a beer garden or bar, you’ll inevitably need to deal with folks that have had too much to drink. These situations can be challenging and it’s your job to maintain a level of professionalism and coolness factor even when someone else is not being nice. You can influence the types of people you meet depending on when and where you vend, but dealing directly with all sorts of different people can be tough. Control Your Time – This is a big one for Gladfelter as he explains in today’s podcast episode. Gladfelter got to spend the whole summer with his kids since he had such a flexible schedule. If you need to take off due to a kids baseball game, go ahead and shut down the cart for the afternoon and attend. This type of business unlike just about any other in the food industry is unique that you can operate around your schedule. With a restaurant, you’ve got a set amount of hours you need to be open for each day. That’s not that case with a cart. 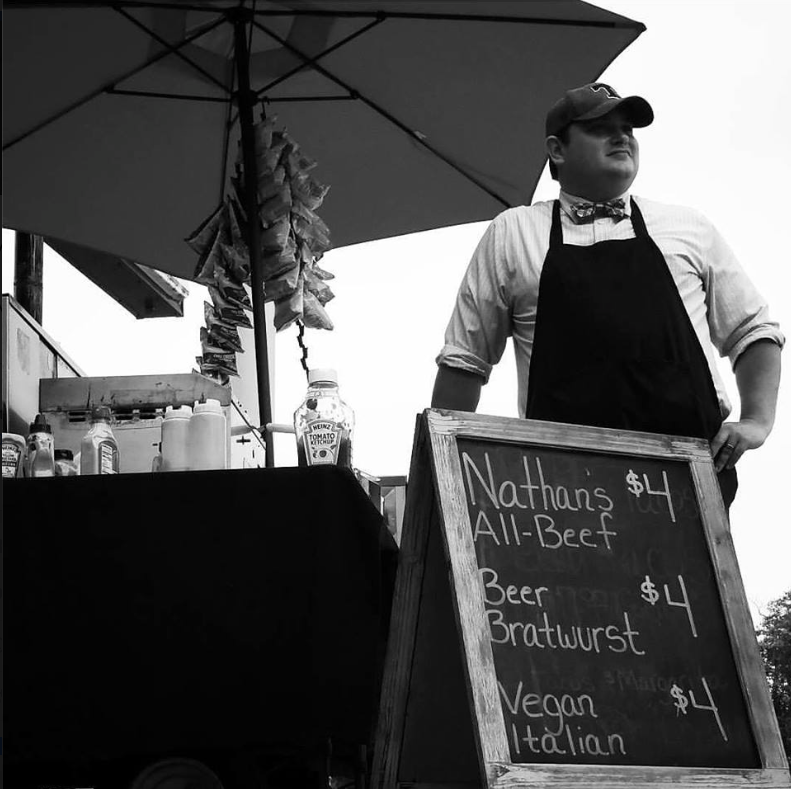 Low Cost to Get Started – We’ve discussed this before, but Gladfelter was able to start his hot dog cart business for less than a $5,000 initial investment. He has purchased an upgraded cart with all the bells and whistles since that time, but he was able to prove the model to himself and the business plan by doing this. There are not many real business you can get into for under $10,000. From there success or failure is largely determined by how much hustle you put into the operation. Ability to Scale – If you have aspirations of making really large sums of money beyond the $100,000 per year revenue mark, your business needs to be able to scale. With a hot dog business this is a real possibility because adding new carts isn’t going to break the bank once you start generating an income. If you want earn more, just add another cart and hire someone to operate it. There are some business owners that over the period of a few years have added over 100 carts. Just imagine how much income you could generate with even a small amount of net profit being generated from these vehicles on a daily basis. Your job will become significantly different if growing your business is the goal. Instead of focusing your time on operating a single cart, your focus will be on managing people and making sure you’ve got systems in place to train new vendors you bring into the system. Still, it’s reassuring to have a business that you know can grow if you want it to. Your scale of growth is limited to your imagination, to think outside the box a little, and to create a great brand and experience for your guests. – Matt Gladfelter the growth potential for this business model. It is an exciting way to live, but it’s not for everyone. – Matt Gladfelter on operating a hot dog business. There’s a reason there’s a lot of used hot dog carts on Craigslist. I think that’s because a lot of people do ignore the fact that this is hard work. – Matt Gladfelter getting real about how much work it is to operate a vending business. Total Cost Breakdown for Hot Dog Business Startups – Learn how much it costs to start a hot dog business. Hot Dog Business Plan – Ready to start your own hot dog cart? Learn how to create a business plan and conduct market research in your area. How much income can you make on a hot dog cart? – Find out if you can actually make a decent living in this type of business. Hot Dog Cart VS Food Truck: Which is Right For You? Market Research Template, Startup Cost Spreadsheet, and More Included!